The Secure Snuggler is a high-end bed designed to combine, in the words of the designer, "skeletal support, soothing comfort and Lux style. Designed is an outstanding bed for a pet that supports them while sleeping instead of a lumpy bag or bed that provides minimal comfort. The Secure Snuggler is a non-porous high-density minicel® bed frame supporting a memory foam mattress wrapped in designer fabrics that add a luxurious element to your home. All our beds are hand made in Los Angeles. Gift Idea: the finest, comfort and elegance for pets. Free travel bag included. If you're one of the millions of people that view your pet as part of your family you may want to consider dropping the $79.00 + to give your pet a wonderful night, morning, and afternoon of sleep. The Secure Snuggler is hand made in the USA. Each purchase comes with a free travel bag for the bed. Visit "The Secure Snuggler by Freinds of Cashmere"
The Secure Snuggler combines skeletal support and luxurious style. Crafted with memory foam and designer fabrics, accented by a hand-made gold bullion crown, this bed will make any pup feel like a king. "Hey! We don't just care about you. We are also looking out for your dog's ergonomic issues!" 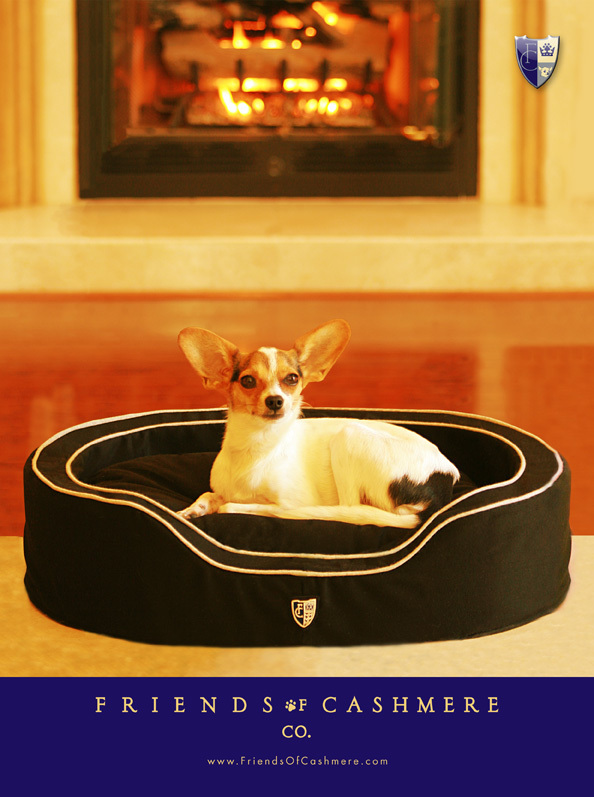 Introducing an ergonomic dog bed with classic design by Cashmere Co. Finally, all faithful companions have found a voice in this handmade, well-crafted, luxuriously therapeutic Secure Snuggler®. for the ultimate combination of skeletal support, soothing comfort and Lux style. The goal was to create a place of rest that would cradle the developing structure of a puppy and adapt to the aging process providing an exclusive individual support system. An innovative frame of moisture resistant minicel® construction and a memory foam pedic pillow are covered in a plush Italian cashmere and merino wool blend, providing cozy support and maximum relaxation. Pet owners will have a nice surprise in the stylish design as it integrates beautifully with home decor in rich colors. The Secure Snuggler is proudly handmade in the USA and accented with the Royal Bullion Crested Crown logo, which has been the mark of excellence for centuries. 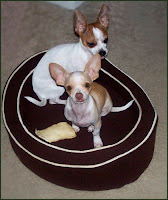 The Secure Snuggler® dog bed comes in two sizes, Classic (23” x 17” x 6”, MSRP $249.99 and The Toy (19.5” x 14” x 5”, MSRP $199.99). There are nine attractive color combinations to choose from. The bed’s design provides “man’s best friend” with the greatest comfort, while adding a illustrious design element to any room. This "French Poodle of dog beds with the heart of a bulldog illuminates the pet market as the ultimate gift to companion pets. I love The Doggie Bed Company! When it comes to comfortable beds, there is nothing that can beat the softness of memory foam beds. Why? Well if you asked that question, then certainly you haven’t laid on one. Now how to describe the softness of memory foams, well a very specific description of it is that when you press your hands on it, then remove it, you will see a perfect impression of the same hand. This is the reason why it’s called memory foam, it memorizes form. Memory foam is made from polyurethane with additional chemicals that add to its viscosity level, thereby increasing its density. Depending on the chemicals used and its overall density, it is firmer in cool temperatures and softer when warm. The first memory foam was developed by NASA. It was used to decrease the very high pressure caused by the extreme g-force occurring during the take-off of the space shuttle. But it was never used in the space program but was subsequently used medically, for example by patients who used to lie in bed on hard or very firm mattresses for long periods of time without regularly moving such as being bed-bound after a paralyzing stroke. Memory foam was initially too expensive for general use, but in recent years it has become cheaper to produce and is now widely available. Its most common domestic uses are mattresses, pillows and mattress toppers, which is why there are now beds made out of memory foams. But did you know that memory foam can also be found on dog beds? Yes, there are some dog accessory shops that can provide their customers with memory foam dog beds. And the best place to look for some memory foam dog beds for sale would be the internet. There are a lot of memory foam dog beds for sale, but if you would look on the internet, they could offer you more memory foam dog beds for sale such as designer memory foam dog beds for sale, cashmere made memory foam dog beds for dogs for sale, large and extra large memory foam dog beds for sale, orthopedic memory foam dog beds for sale, luxurious memory foam dog beds for sale, small and big memory foam dog beds for sale, rounded memory foam dog beds for sale, some cheap or discounted memory foam dog beds for sale, outdoor memory foam dog beds for sale, heated memory foam dog beds for sale, bolster or commonly known as the donut shaped memory foam dog beds for sale, some unique memory foam dog beds for sale, a wicker made memory foam dog beds for sale, some cute memory foam dog beds for sale, and many more memory foam dog beds for sale. So if you ever wanted your dogs to also experience the comfort that memory foams can give, then memory foam dog beds are perfect for you. The Secure Snuggler by Cashmere Co.